Bikes can be seen as a form of transportation. Many individuals may choose to use bikes as a way to get from place to place. They may see it as a quicker way to get to shorter distances. It can also be used as a form of exercise to keep healthy. When riding a bike, cyclists should remember to wear a helmet and any other safety equipment that may be necessary. Bikes can be dangerous when they are sharing the road with motor vehicles. Since they offer no safety, people can be seriously injured if they crash with a car. If you have been the victim of a car accident while riding a bike, you should seek medical attention immediately. After obtaining care from a healthcare professional, it is best to contact an attorney to help gather information for your case. The documentation created in your doctor’s visit can be used to prove the extent of the injuries you sustained from the accident. If you are able to preserve evidence from the accident, such as taking pictures of the scene or talking to witnesses, you should do so to better support your case. This information may be able to prove negligence on behalf of the other party that was involved in the accident. 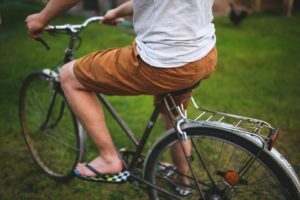 There are many factors that can lead to a bicycle accident due to the negligence of another party. These factors can include someone who was driving under the influence, careless or reckless driving, using electronic devices while driving, distracted driving or driver fatigue. Road conditions may also play a role in causing the accident. A municipality may even be liable due to bad road conditions of bicycle lanes and sidewalks. Personal Injury Protection is an insurance plan that most automobile policies have. This is a form of no-fault insurance that protects victims of automobile accidents. It can help victims by providing financial support without any reference to the liability of any party. Through PIP insurance, the monetary value of medical bills and lost wages may be covered. This can be greatly helpful to victims who have suffered in these kinds of accidents.